A Reader Asks: How long do I smoke a Polish sausage? Answer by: Smoked Polish: Our family has been doing this for years and I am at very least a third generation smoker. We use a cardboard barrel and hang the links on broom sticks. Cover barrel with a couple of rugs and adjust temperature and smoke by cracking open the rugs as needed. Temp measured at top of barrel directly under the rugs with a digital thermometer. Smoking temperature is kept at 225 to 250. Smoke sausage for about 3 hours turning them every 45 minutes. After that time it is ready to eat. As long as it is fatty enough they will not dry out. We like the sausage best the next day after cooling in refrigerator over night. Tried making a lean batch once and had to throw it all out. Wood choices are Cherry, Hickory and/or Apple. Just finished a batch yesterday and it is awesome. Smoking Polish Sausages - How Long Does It Take? As long as it takes. When smoking them, keep the smoker temperature down if possible, to between 180-200 degrees. At that temperature it should take around an hour or so to bring the sausages up to the correct internal temperature, which is 160 degrees. Cooking them any hotter will cause the juices to run out, and they'll be dry and mealy. Actually heat treated sausages need only reach 144 degrees, for trichnae (According to FSIS Reg 318.10(b)). If fully Cooked they must reach 160 degrees (According to Appendix A for Compliance). Also ensure proper chill down of 130 to 80 in 90 minutes or less, then 80 to 40 within 5 hours, or 120 to 55 in 6 hours then 40 before packaging. This is also after reaching your desired temp. (According to Appendix B for Compliance). Everyone please check the FSIS website or consult a FSIS tech before cooking or heating to ensure your own safety. Also please handle fully cooked sausages with extreme care after lethality (160), to ensure that there is not contamination of Listeria Monocytogenes. Also proper chill down to avoiding Spore forming bacteria. (C. perfringens). As a USDA plant manager I can ensure you a lot goes in to preparing your foods. Use common sense or you lack this please do not smoke any meats. When smoking sausages it's not so much a matter of how long to smoke them, as it is to what temperature to smoke them. 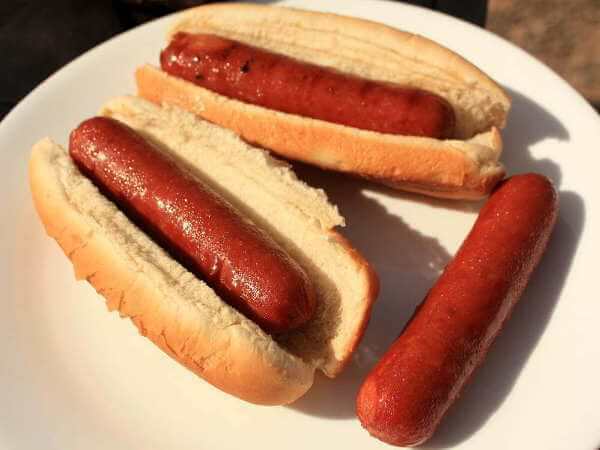 Uncooked sausages need to be heated until the internal temperature reaches 160 degrees Fahrenheit according to the USDA. The meat will be safely cooked if it reaches 155 degrees, and remains there for at least 15 seconds, but by following the USDA recommendation, there would be no doubt about safety. If the sausage is heated much beyond that point, the fat in the meat will melt, and moisture will evaporate out, making the sausages less juicy. This rope of homemade sausage was made with a combination of venison and pork. It was previously smoked to add flavor, then frozen for storage. We remove the sausages from the freezer as needed, thaw in the refrigerator, then grill with indirect heat. When the temperature reaches 160˚ F, the venison sausage is ready to eat! We heat these in the smoker sometimes to give them extra smoke flavor. 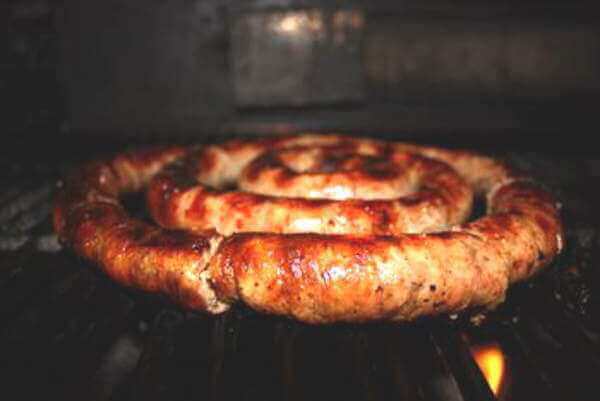 Using a smoker temperature of 200˚ F, a rope of this sausage reaches 160 degrees in 60 to 90 minutes.